I just ordered most of your products and would like to know how and where to start. I will be using them for putting the boat away for winter. The finish is good I usually wax before wrapping. I would like do it right the first time. You didn’t give me much information so I will assume that your boat is a fiberglass powerboat on a trailer with some marine growth and staining on the bottom. If I guessed wrong, you can re-submit your question with more detail or refer to the other questions in the forum for specific answers. 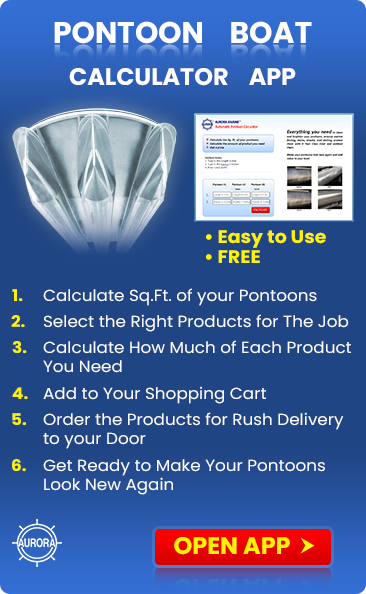 Boat owners that clean and protect their boats in the fall using the following guidelines report that their boats still look new after more than 20 years. Before you get started, download the Fall De-Commissioning Check List from the forum and use it to make sure that you don’t forget something, which might result in damage to your boat over the winter. It is also very helpful for organizing your tasks and time. Generally, the first thing to do is clean the bottom. If you have growth, use Algae Strip. The instructions are on the bottle or on the Waterline Stain Remover. 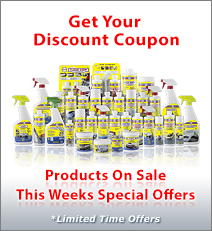 Next, wash the entire boat, including the seats and carpets with Boat Clean Plus. Refer to the directions on the bottle for dilution strengths and specific instructions. A scrub brush and Marine Power Mitt will be helpful for this. After, deep clean the fiberglass surfaces with Boat Scrub. Use the Marine Power Mitt for this. 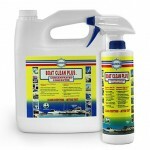 If there is any oxidization, scuffs or stains, the Boat Scrub will get them out (except waterline stains). 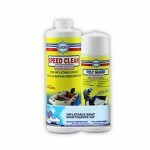 Also use the Boat Scrub for cleaning the rub rail, power cord, fenders, stainless steel rails, the inside of refrigerators and coolers, stainless steel sinks, toilets and any other hard surface. When the boat is pristine, apply one coat of VS721 Bottom Coat to the bottom, one coat of Premium Boat Shine to the hull, 2 coats of Sure Step to the deck and one coat of Vinyl Guard to the vinyl seats. In the spring, you will only have to wash the boat with Boat Clean Plus and water, apply a 2nd coat of the protectants and you’re ready to go. 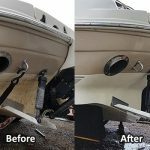 If you have a holding tank, use Odor Free and follow the instructions for the Holding Tank Cocktail, to prevent you boat from smelling in the spring. I also suggest that you charge your bilge with Bilge Bath to reduce odor in the spring, in the event that water finds its way into the bilge. Also, be sure to protect your boat against vermin before you wrap it for the winter. Instructions are in the forum. Of course you will have to winterize the motor, drives and plumbing, service the trailer etc. Refer to the Fall De-Commissioning Check List for more information on this.